Amy Leggett-Auld, a Part 2 City BEng Civil Engineering with Architecture student, has won the 2016 Association of Women in Property’s South East Region Award. Amy Leggett-Auld is the winner of the 2016 Association of Women in Property’s (WiP) South East Region Award. 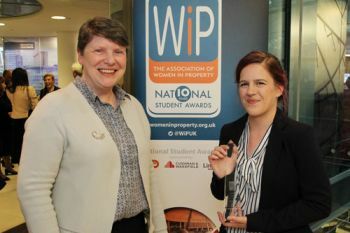 The Association of Women in Property encourages girls and young women to enter the property and construction industries through an extensive education programme that includes its own National Student Awards, now in its tenth year. Amy has qualified for the National final which will be held at Claridge’s in London on 21st September. She will be competing with students from all over the UK for the coveted National Student Award trophy. ”Amy has done really well to win one of the Regional awards and we are delighted she will be representing the South East at the national final in September. This is a tough competition with some extremely talented, enthusiastic and professional young women taking part, all of which bodes well for the industry recruitment pipeline. Building restoration is a process in the construction industry where a building of historic value is restored to the appearance of its original quality. Meticulous attention to detail is given to using original building materials in most building restoration. Construction techniques and knowledge of the building's past construction are also used to maintain its value as a part of the local cultural heritage. To make the restoration as authentic as possible, researchers and historians acquainted with the building are consulted by contractors and architects to make sure that the work done genuinely mirrors original design parameters.